Below are the most effective methods for paying off your debt fast and saving yourself thousands of dollars. These techniques save you the most money when used on mortgages (because mortgages involve big numbers and long periods of time), however, they can also be used to pay down other debts quickly—like car loans or even credit cards. This is the easiest way to pay your mortgage down faster. Making bi-weekly mortgage payments rather than monthly payments will usually reduce the time it takes to pay off your mortgage by several years. Here is how this trick works. Let’s say Mike and Cindy obtain a mortgage that has monthly payments of $1,000. Instead of paying $1,000 per month, Mike and Cindy could ask their bank to chop their mortgage payment in half and make the payments $500 every two weeks rather than $1,000 per month. This will be fine for the bank since they still get paid $1,000 every month, and as far as Mike and Cindy are concerned, paying $500 every two weeks is almost the same as paying $1,000 per month. However, even though this doesn’t feel any different to Mike and Cindy, it will shave 3.5 years off of their mortgage and save them over $21,000 over the life of their mortgage (assuming that their interest rate stays the same). Here is how Mike and Cindy will save so much money. If they made monthly payments, their bank would debit their account for $1,000 twelve times a year (12 months x $1,000 monthly payments = $12,000 in annual mortgage payments). Now when they cut their monthly payment in half and get their bank to pull $500 out of their account every two weeks, they end up making what amounts to one extra monthly payment each year (26 bi-weekly payments x $500 every two weeks = $13,000 in annual mortgage payments). Most people would never guess that making one extra mortgage payment each year could save them so much money. When people find out how much money they can save and how many years they can shave off their mortgage, most end up using this clever little idea. If you want to be really aggressive, you can pay weekly, but it doesn’t give you the big savings that bi-weekly does over monthly payments. Have a look at the table below to see how monthly, accelerated bi-weekly, and accelerated weekly payments compare. How it works This is the payment that your bank or credit union tells you that you must pay each month. Cut your monthly payment in half and pay that amount every two weeks. Divide your monthly payment into quarters and pay one quarter of your monthly payment every week. Round your payment up to the next large number. 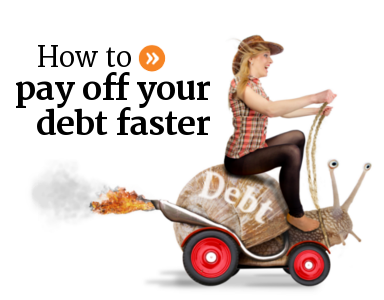 Paying extra each month will help you get your debt paid down faster. If you want to get really aggressive with your mortgage payments, round them up to a higher number and then cut that number in half and pay it bi-weekly. Just make sure, though, that your budget can handle these larger payments. If you head down this road, you may also want to talk to your banker about creating a safety net to fall back on if you end up taking on more than you can chew. You can sometimes do this by officially setting up your mortgage with the lowest payments possible and then sign a voluntary payment option agreement to accelerate your payments. In the future, if your finances become strained you can always revert back to what you can afford. When you have some extra money, consider using it to pay down your credit card, loan, or mortgage. It will pay you big dividends in the future. Extra money can be found when you get a bonus at work, get a tax refund, or receive some unexpected money (click here for more places to find money to pay things down). All extra money that you pay on a credit card, loan, or mortgage goes straight to paying down your principal balance. As long as your payments are up to date, no part of your extra payment will ever go to interest. This is because your regular monthly payment pays the interest. Anything extra that you pay goes straight to reducing your credit card, loan, or mortgage balance. This gets your loan paid off faster and saves you paying the bank more interest. One of the biggest investments you can make in your financial future is to pay off debt. Once you've got a plan in place and your debt reduction strategy is working, it may be time to start looking for a financial advisor to help you invest and grow your savings.